When you're ready to compete outside your comfort zone, you're going to have to size up unfamiliar tables in unfamiliar environments. Many factors can affect how the rails play, and you must be able to determine whether they are playing short or long before trying kicks, banks and position play. Here's a warm-up shot that I use to gauge the action of the rails: a three-rail kick shot from corner pocket to corner pocket. Stroke this one with a half-tip of high-left English, and your first aiming point is the sixth diamond down the rail. If the cue ball ends up short (i.e., on the long rail) you'll need to compensate during your match for how the balls are coming off at shorter angles. 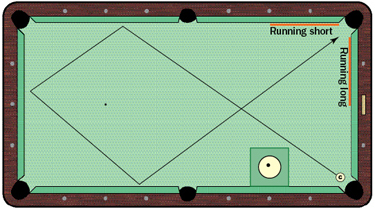 If the cue ball hits the short rail, the table is playing long and your angles off the rails will be wider. In general, tables play short in humid conditions. You may also encounter "boingy" rails. That's when the rail is super-reactive, providing a stronger bounce and shorter angle than you're accustomed to. The danger of boingy rails is that players tend to let up on their strokes to minimize the bounce. But when you start thinking about decelerating your stroke, you risk underhitting and getting out of rhythm. My solution is to keep the same smoothly accelerating stroke, but shorten the backswing by as much as half. Essentially, you just make your stroke more compact.